So here we go again, Melbourne. Time to don your grey matador felt hat, black Wayfarers, and plunge head and glass first into another summer drinks festival, this time with old mate gin. But first, I digress. I have a (crazy) friend who ‘detests gin’. Is this really any way to treat such versatile and forgiving liquor? Is anyone really that (g)intolerant? One might think a dedicated Australian gin spectacle to brandish the diversity of this cocktail staple is a fitting remedy. A (g)intervention of sorts. This was essentially the aim of the inaugural Juniperlooza Gin Festival: provide gin virgins and veterans alike with tried and tested favourites alongside imaginative new twists to accommodate all palates. 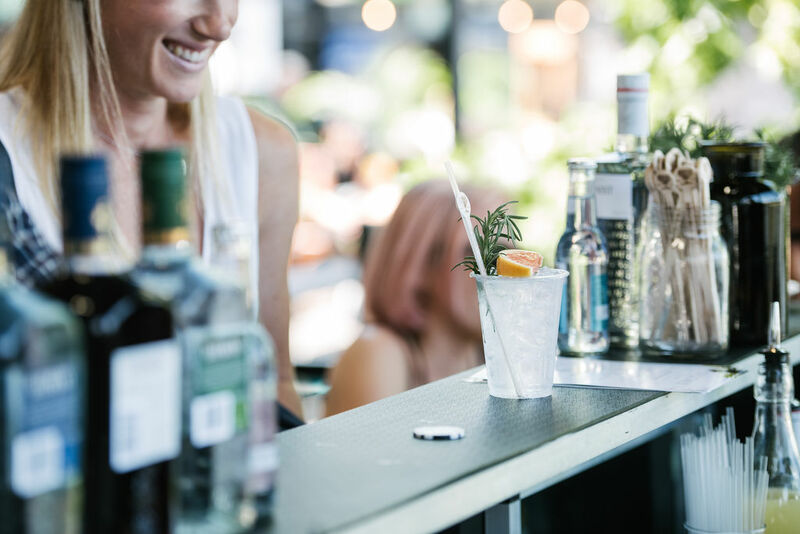 The sun-drenched Riverland and Pilgrim Bar decks along the Yarra were idyllic platforms to tick these goals and launch Australia’s first gin festival. Water views, G&Ts, food, and live DJs on a summer Sunday are worth cycling to from the north. Juniperlooza played the international uncle at Christmas, uniting the whole family — Archie Rose, Bass and Flinders, Four Pillars, and The Grove Experience — to celebrate their trade. Distillery and Melbourne bar reps manned pop-up gin stations between Riverland and Pilgrim, while the two host venues offered tailored, gin-inspired fare. Let’s see: Oysters with Tom Collins granita, chicken slider with juniper feta, and Popstic’s Negroni sorbet. See, friend-who-detests-gin, gin is versatile and cool. My +1 Jenny and I found the token-as-cash system simple and pretty effective. Custom-made poker chips were a nice touch. The two-day event also held masterclasses to turn your non-gin friends into better people. Gin is laden with weird and wonderful botanicals, so chatting with distillery and bar reps can help you dissect its flavour profiles and then impress your uncle at Christmas with your new gin powers. Lemon myrtle, wattleseed bark, ice plant, and, of course, juniper, are some of the many gin botanicals, but don’t hastily synonymise complexity with flavour. Stripped-back, organic batches with minimal botanicals can really let your G&T sing with a balanced, dominant note. If you want more bite, West Winds The Broadside Navy Strength gin at 58% ABV burns in all the right places. So, friend, have I sparked your (g)interest? 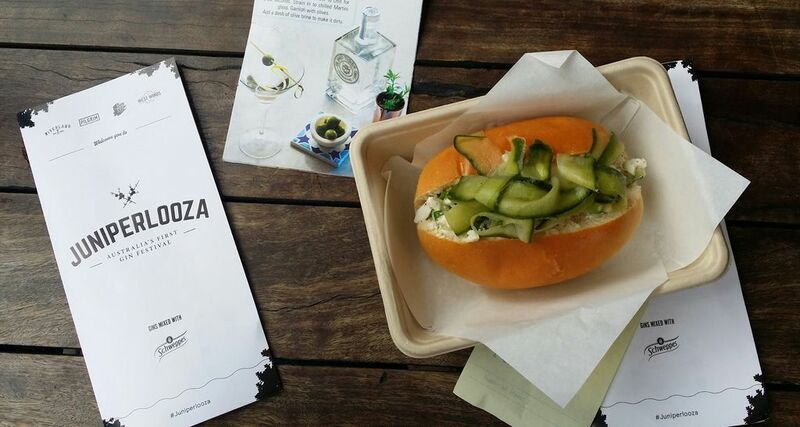 Ate: Lobster roll with soused cucumber from Riverland and gin canapé box from Pilgrim. Drank: Gin. The Grove Experience London dry done neat (no ice) is bomb. Matt is a mad scientist by day and beer connoisseur by night. When he’s not devouring a new set of craft beers you will find him in a dankly lit room plotting his approach at the next alcohol-related festival. Check out the Juniperlooza Twitter and Instagram for recaps and to find out when the next gin festival will happen (can’t be soon enough). Visit Riverland and Pilgrim Bar for the perfect gin cocktail by the Yarra. Disclosure: The Plus Ones were invited guests of Thrive PR.